Time flies fast, today 31st December marks the last day of year 2009 and almost everyone is preparing for the countdown to welcome another brand new head start of the year 2010. In order to avoid the New Year crowds, we decided to have our celebration dinner one day ahead. Since we prefer to eat at somewhere nearer instead of going to the town, we decided to settle our dinner at Buckaroo BBQ and Grill. Had about this place a few years back when my mum used to patronise their food with her boss and colleagues. 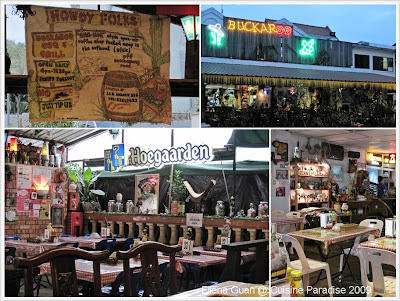 Buckaroo is sort of a typical American restaurant that is located at Andrews Avenue near Sembawang Park. You can take Bus No. 882 from Sembawang Bus Interchange which you can drop at the bus-stop near Sembawang Park around 1st Car park Entrance. They opens from Wednesday to Monday from 4.30pm to 10.30pm. Since they have a very good reviews from magazine and media on their special Buffalo Wings, we decide to get it a try too. Base on the recommendation of the waiter, we order half dozen of Grade 2 spiciness wings with 1 normal for the kid. According to the menu, they have 3 different level of spiciness for their Buffalo Wings. 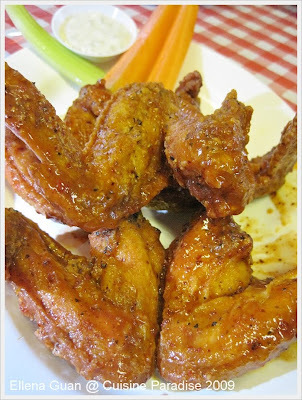 For your information, Buffalo wings are often fried chicken wings that are coated with special sauce. This sauce can be made with a variable amount of spiciness corresponding to the level of heat, such as mild, medium, or hot. The main ingredients in the sauce are a vinegar-based cayenne pepper hot sauce and butter. This is the Grade 1 Buffalo Wing which does not have any sauce coated onto it. 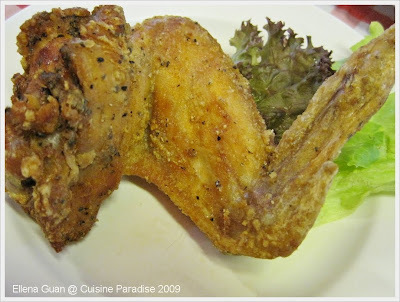 The outer skin of the wing is very crispy and overall the chicken is very well marinated with the herbs and spices. From what we see, we guess that the different between each Grade of spiciness might be due to how much sauce the wings have being coated with. Which means, the more sauce, the more spiciness it is. The price of this Buffalo Wings might be slight higher at S$18.80 for half a dozen which mean around $3 per wing, but if this suits your tastebud, I am sure it will be worth for the cost. Look at this, isn't it gorgeous! 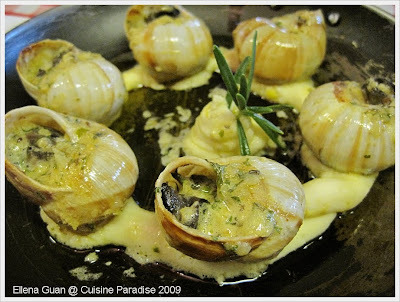 It has always being in our thoughts to try Escargot after our last taste many years back. And so happening, when we saw this appetizer appears on the menu list, we decided to order without much hesitate. To our delight, this appetizer is great with the combination of butter garlic sauce and addition herbs and mashed potato. This is indeed worth the price of S$16.80 for half a dozen. After the appetizer and finger food, here comes our Main Course for tonight. We are having this Medium Well done Beef Tenderloin with Mushroom Sauce that served with Bake Potato and Mixed Vegetables. 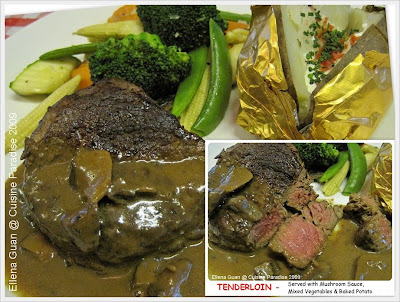 The Tenderloin is juicy and nicely done to our liking and it really taste great with the Mushroom Sauce which infuse with a little buttery taste when you eat it. Ichiban Sushi has a about 8 branches around different parts of Singapore. 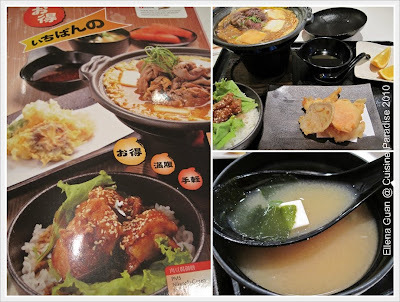 They provide fresh sashimi, sushi from Nigiri, Temaki handroll to the unusual Kaminabe paper steamboat, hot-pots and other palatable varieties that sure to capture the tastebubs of you and your family members/friends. Since it is during lunch hour, I ordered one of their lunch special called "Nikotofu Gozen" at S$16.90 per set. This set consists of Beet & Tofu in Hotpot, Teriyaki (Honey Sesame) Chicken Don, Assorted Seafood Tempura, a bowl of Miso soup and slice fruits. Their Teriyaki Chicken Don that comes with the above set taste great and the chicken is not overcooked and too dry when consumed. The teriyaki sauce is goes well with the rice and it's not too sweet/salty. The Beef & Tofu hotpot is being cooking in flavourful broth with tender beef slices, tofu and egg. The mixture is being cooked over a small flame below the hotpot and the dish is kept hot to maintain it's flavour. Em... but personally, I find the broth a bit too salty if it is to eat alone without the rice. Lastly we choose this for our dessert...... I remember clearly during my late teens to early twenties, Fiesta is one of the early pioneer Japanese restaurants established in 1991 that introducing sushi on conveyor belt. As most of my classmate and I are a big fan of their Fiesta cheesecake we will always get together to patronise their restaurant to eat their cheesecake. 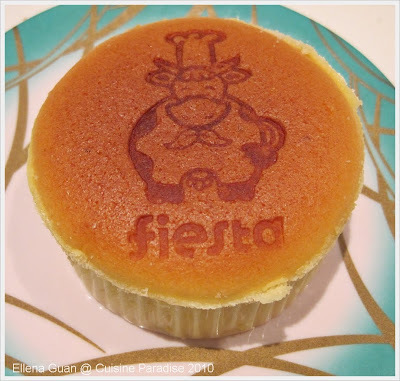 And today, Rey and I are so happy to see the new version of this "Mini Fiesta" Cheesecake which is fluffy and light to it's taste and it is available on Ichiban Sushi conveyor belt @ S$2.10 each. Double-boiled pear soup is always one of my son favourite herbal drink, he will always pester me to cook pear soup for him whenever he sees "Pear" in the supermarket. 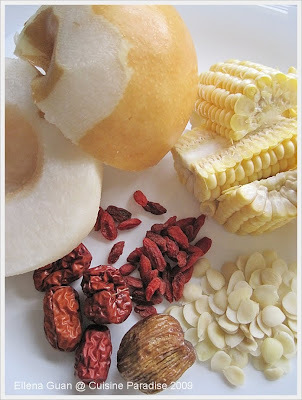 And from my "Soup - Herbal Tea" list you can see two different version of sweet Pear soup. But today instead of cooking pear dessert soup, I decided to try something different. I got this idea from my colleague whose mum is a very good Cantonese cooker as well as soup maker. 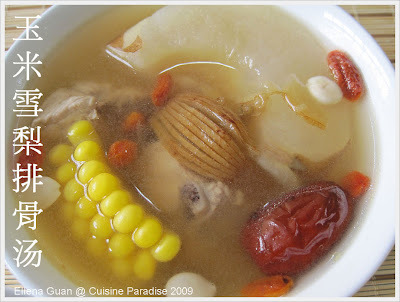 I used to hear from her that one of her favourite soup that her mum always boil for her is this "Sweet Corn & Pear Soup". So after confirming with her roughly what are the ingredients used, I decided to give it a try. 1. Blanched the pork ribs in boiling water for 5 minutes. Drain them thoroughly, then set aside. 2. Use a clean pot, bring 1000ml of water to boil, add in sweet corn, pear and the rest of the ingredients except Wolfberries. 3. When the soup comes to boil again, lower the heat and simmer for about 30 minutes or so until it is favourable to taste, add in the wolfberries and simmer for another 5 minutes or so. 4. You can serve it with rice or before meal. 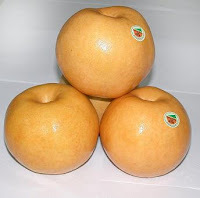 ~ Shingo pears are one of the popular export fruits. They have light golden brown peels, and taste very sweet and juicy yet have crunchy texture. 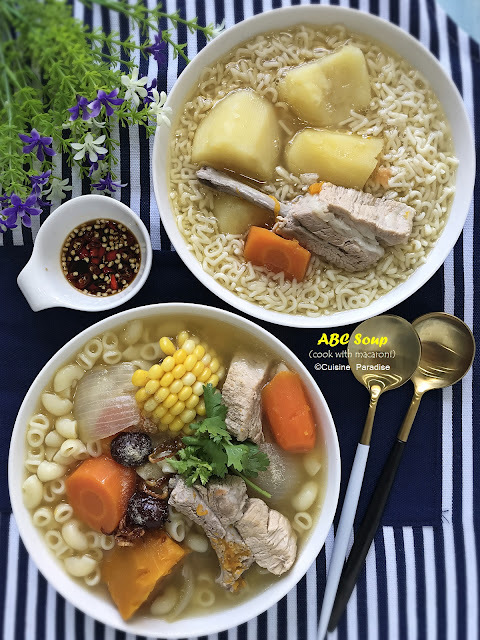 This is indeed a very delicious soup that is full of natural sweetness and fragrance that is infused by the sweet corn and pear and the rest of ingredients. This taste just as good as the sweet dessert version but if you don't prefer to mix something sweet to go with your meal. I will suggest that you can have this soup either before meal or after your meal. 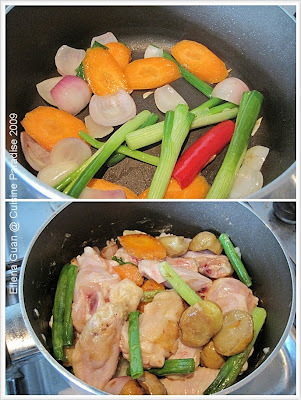 Cooking one pot dish is always one of my favourite, especially those using Claypot method. I love the way the food is being braised with the sauce under low heat and slowly cooked through. Out of so many claypot dishes, braised Chicken with Mushroom and Chestnut is always one of our favourite and we can just have this dish with extra bowl of rice just to polish up the gravy which is so flavourful. But this round as I was rushing to prepare the food in a short time before going out, I didn't use the claypot, instead I give the basic ingredients a quick stir to enhance the flavour then braised it in a heavy-duty saucepan for about 20 minutes till the chicken is cooked through. Then I transfer it to a Corning ware pot to keep warm and easy serving. 1. Clean, trim and cut the chicken wings into wing and drumlet portion. Lightly marinate it with some pepper and light soy sauce. Set aside while preparing the rest of the ingredients. 2. Bring a pot of water to boil, add in the fresh chestnuts and let it simmer for about 10 minutes on medium heat. Remove, drain well and peel off the shell and outer skin. 3. Preheat a heavy-duty saucepan with 1 tablespoon of oil, saute the onion wedges and spring onion for about 20 seconds, add in the carrot and chilli and continue to fry for another 30 seconds. 4. Next add in the marinated chicken pieces and continue to stir on and off till the outer layer of the chicken is slightly brown. 5. Add in the oyster sauce and stir till all the mixture is combined, add in the chestnut and mushroom. 7. When done, remove it from heat. Dish into serving plate and top with extra spring onion and chilli for garnish. ~ You can omit adding chilli if you are to serve this dish to kids. But by adding chilli it will enhance the flavour ever better. ~ Adding cornstarch solution is to thicken the sauce and give it a glossy outlook too. 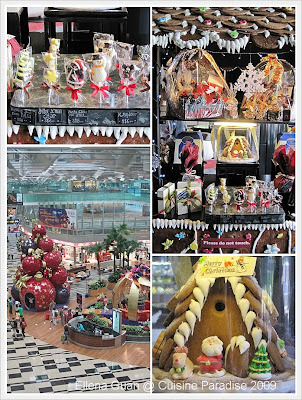 Christmas is a wonderful time to spend with friends and family to enjoy a feast while at the same time admiring the Christmas decoration and lighting along Orchard area. This year there are a lot of interesting design Christmas Tree in or outside the shopping mall of Orchard road. 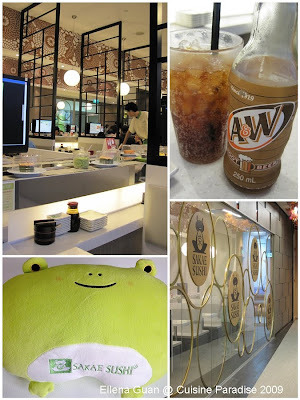 Today we are going to have our dinner at the newly open Sakae outlet at Orchard Central. As usual this outlet brings out an fresh and bright outlook which brighten up the whole dinning atmosphere. For the starter, we had Asari Miso Soup which is just nice and cosy for the raining weather outside. 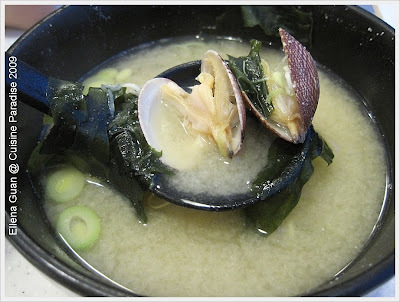 The soup is nice and full of flavour while the Clams are just nicely cooked which brings out it's sweetness. 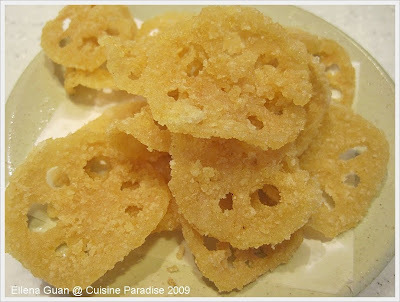 These Renkon Chips (lotus root chips) is one of Rey's favourite. But the chip that served in this outlet seems to be a bit different from the other outlets. As you can see from the photo, the chips seems to be a bit soggy, and it doesn't taste light and crispy from those that we had tried before. I think it is either being soak in the oil for too long or the quality of the lotus root is different. Although Ebiko Sushi is not a must in our list, we will still pick it up on and off whenever we find that it is fresh from the conveyor belt. 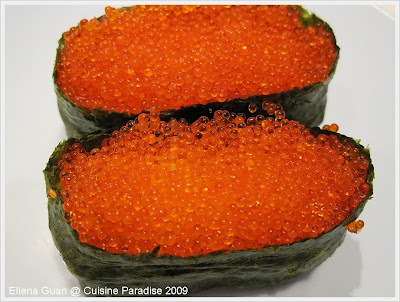 I am sure you will get to fall in love with those tiny, bouncy and juicy egg roe that is served on top of the wrapped sushi rice. The Potato Salad at Sakae is always one of my desire choice whenever I feel like having some cold Salad dish. The mashed potato is smooth and tasty with some addition of carrot cubes. 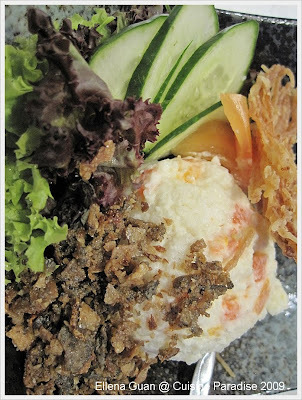 It is served together with some salad green as well as some crispy deep-fried "Salmon Skin" if I am not wrong. Lastly, we sure can't go without Rey's favourite Ebi Tempura, but today we have ordered the Tempura Moriawse instead of all prawns. 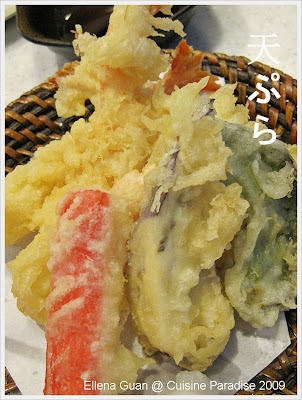 Tempura Moriawse consists of a mixture of Prawns, Imitation Crabstick, Mushroom, Capsicum and etc. The combination of the mix vegetables will varies from time to time depend on the availability. Watercress is widely used in either Asian or Western cuisine. 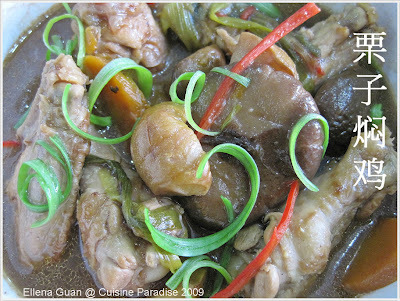 Mostly in Asian countries, we used it to boil soup with different ingredients like chicken or pork ribs. It sometime refer to as a cooling soup for heaty weather. Whereas in Western cuisine, Watercress is usually eaten raw or appears as a garnish, in salads or on sandwiches. This is a great vegetables that is loaded with iron, calcium, folic acid and vitamins A. No matter which method you prefer to consumed this leafy vegetables. 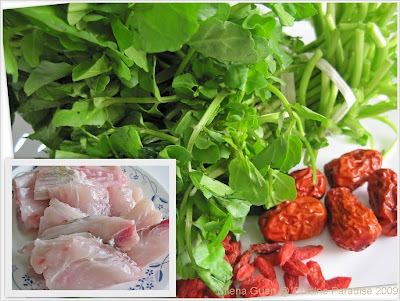 Today, I am going to share with you another way of cooking watercress soup with Fish instead of the common ingredients we used to add like "Chicken or Pork ribs". I am sure you will like this new way of preparing your usual watercress soup. 1. Cut off the stem portion of the watercress, rinse it well and reserve it for the boiling soup. 2. As for the leaves portion, removed those wilted leaves, rinse a few times to get rid of the soild and dirts then set aside for later use. 3. Clean and cut the fish fillet into big portion, marinate it with some cornstarch and light soy sauce and set aside in the fridge. 4. Cut the tailbone into halves, fry it with 1/2 teaspoon of oil and ginger slices till fragrant. 5. Pour in water and sprinkle some salt, bring to boil together with the watercress stem and red dates, then lower the heat and continue to simmer for another 20 minutes. 6. When done, strained the soup, add in the watercress leaves and boil briefly. 7. Lastly add in the marinated fish fillet and wolfberries, cook until done. 8. Season with salt and pepper serve hot with rice. ~ I bought the tail portion of sea bass from the wet market, and I ask the fishmonger to separate the tailbone and fillet for me. 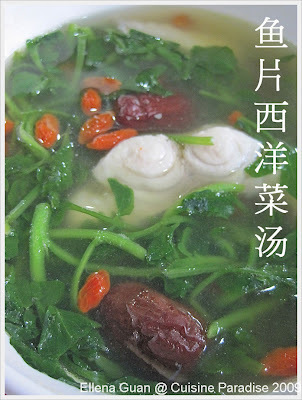 ~ For this soup, try to get a bunch of young watercress because of the short cooking time. 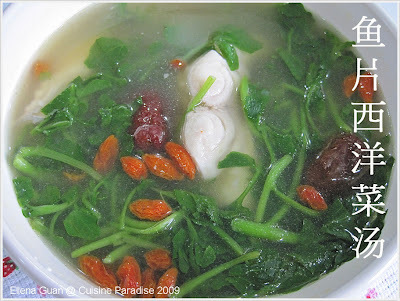 I have tried cooking a few version of the watercress soup in this blog before and this is indeed a new taste that you might want to try it out. 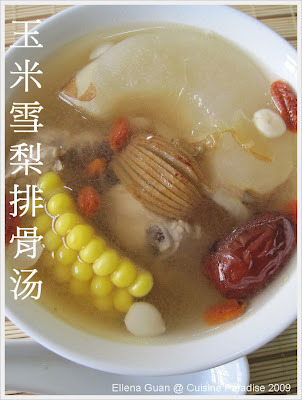 It is full of Nutrition by adding fish and vegetable in a one pot soup. And I am sure this will add to your collection of making a new watercress soup than the usual one. 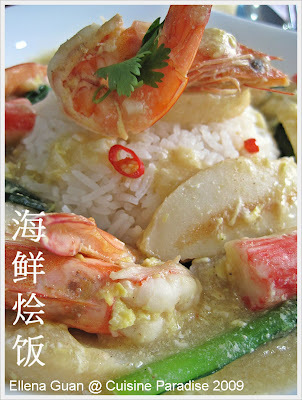 "Mui Fan" is one of the common local Zhi-Cha" (煮炒摊) dish found in either food center or coffee shop around Singapore. But sometime you can also spot this similar dish in some high-end Chinese restaurants where they added some premium ingredients such as scallop, abalone and etc. 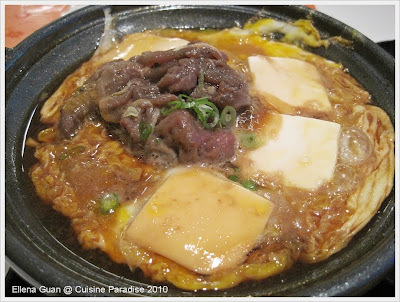 Although I used to cook this dish often but it didn't came across my mind to do a recipe post on this until I was chatting with one of my blogger friend about this a few weeks back. So after the conversation, I thought getting this recipe up might be of some use for those reader who wish to try replicate this dish. This is one of my favourite dish that I have learn from my late dad. He used to cook this for me whenever I am in a rush for work or coming back late for dinner. Often he will add in my favourite ingredients to make the egg sauce and spoon it over some pipping hot rice to create a hearty home cook meal. 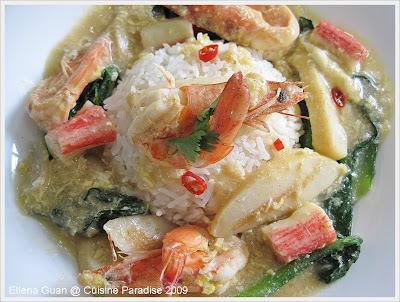 For this dish you can use whatever ingredients you prefer from seafood, meat or poultry to create different version according to your liking. 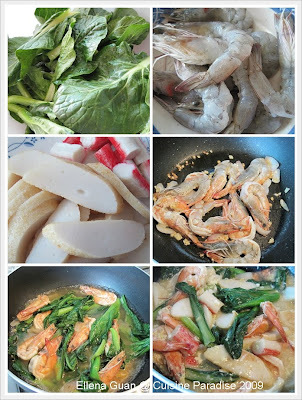 For this recipe I will use prawn, fishcake, crabmeat stick and bunch of choy sum(菜心). 1. Wash, clean the prawns, removed the shell of the body(head retain), slit the back of the prawn and remove the dirty or vein. 2. Marinate prawns with some cornstarch, pepper and cooking wine. Set aside. 3. Trim and wash the choy sum and set aside to drain well. 4. Preheat the pan with 1/2 tablespoon of oil, saute the minced garlic and onion till fragrant, add in the marinated prawns. 5. Give it a quick stir for about 10 - 15 seconds, till it slightly changed colour, add in the choy sum and stir-fry for another 5 seconds. 6. Next add in the fish cake slices and crabstick, and give it another quick stir before add in the water. 7. When the water comes to boil again, crack in the eggs, gently give it a few stir to separate the egg then stir it the cornstarch water to thicken the sauce. 8. Off the heat, season it with some salt and pepper before spooning it on top of the rice. 9. Serve hot with some cut chilli in light soy sauce. 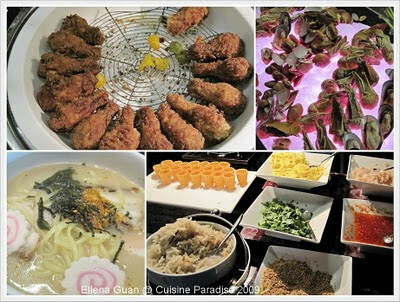 ~ If you are not sure what is "Fish cake", refer to the picture above(2nd row, on the left). It usually come in either rectangle or oval shapes. 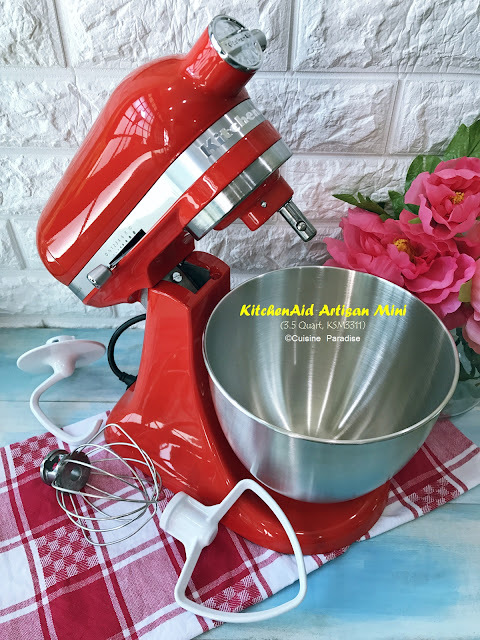 This will come in handy when you run out of idea on what to cook or when you are feeling too tired to do all the preparations or washing. All you need is to gather anything that you can find in your fridge to make into a sauce base to go with your rice. Christmas Season is around the corner, and this is always a wonderful time for family members to get around together to have meal and at the same time update on each others latest progress. Since this weekend, Church service is at Indoor stadium, we decided to go for an High-Tea Buffet at Changi Airport, T3. Azur is located on the 2nd level of the Lobby Lounge of the Crowne Plaza at Changi Airport Terminal 3. 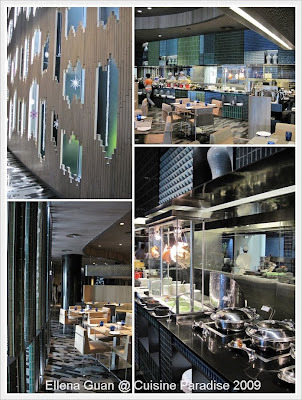 It has two show kitchens with chefs serving the best of the Eastern and Western international cuisines. The environment and layout is great for family gathering of food and chat. The High-Tea Buffet starts from 12.30pm to 4.00pm. 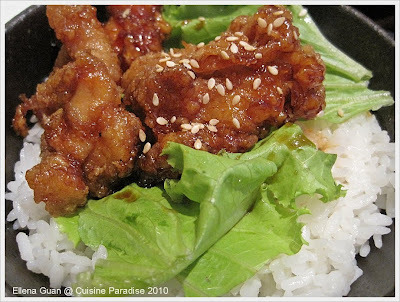 You can choose from finger foods like deep-fry fish fillet to spices chicken drumlets to Japanese Ramen. Or you might fancy some of their cold seafood like prawn, crayfish and mussels. I am those who will always go for the dessert section in any buffet instead of the main eatery. 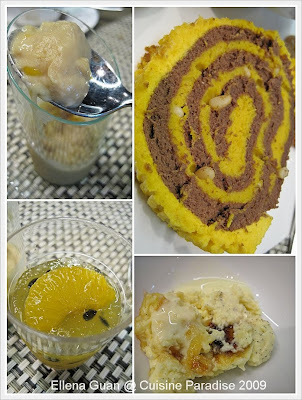 I love to try out all kind of their special in-house dessert. Since now is festive season, they are having some Christmas Pudding and Pumpkin Logcake. Out of the local Singapore Kueh and dessert, we love the Durian Pengat(which is sort of like durian puree mixed with coconut milk and coconut sugar). This is sure a great dessert for the day for those Durian lover like us. Other than Durian Pengat, there is this Mango & Passion fruit gel/jelly that caught our attention. It has a very light and refreshing taste and Mum alone can take about 5 portions of this. 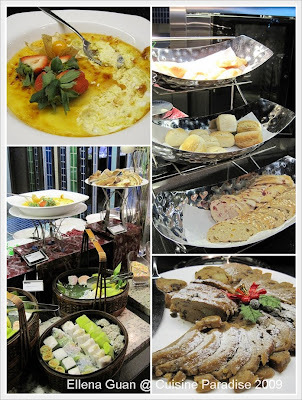 Since this is a High-Tea Buffet, you can see a lot of different kind of Nonya Kueh in the pictures. But personally I still perfect the western cakes and pudding, especially during this Christmas Season. We also managed to take a few shots of these cute little Christmas Cookies and Gingerbread Man house. My son was so thrill when he saw all these cute goodies. I think this is really a good time for kids to enjoy with food and gifts. Overall, the food served at Azur is of their standard and with Citibank Credit Card, you will still enjoy a 20% discount over the total bill.